By default, the first open/save dialog to be invoked during a Chimera session shows the information for the directory from which Chimera was started (UNIX) or the directory of the most recent open/save operation (Windows). This behavior is controlled by the Open dialog starts in directory from last session setting in the General preferences. The directory pathname is shown in the Folder field. Other locations can be browsed by clicking a directory name in any of the panels within the dialog; the leftmost panel represents the top of the directory hierarchy, and each panel going rightward represents the next lower level. Recent directories can be accessed using a pulldown menu to the right of the current directory name (marked with a black inverted triangle). When a file is opened or saved, the directory pathname is added to the recent directory list in the preferences file. The recent directory list is shared by all open/save dialogs. Only the files with suffixes appropriate for the File type setting are shown. Some open dialogs also show files that have been gzipped (as indicated by .gz following the appropriate suffix); these can be recognized and opened. If the setting is all (ask type) or all (guess type), all files are listed. The possible File type settings vary depending on the function or tool from which the dialog is called. 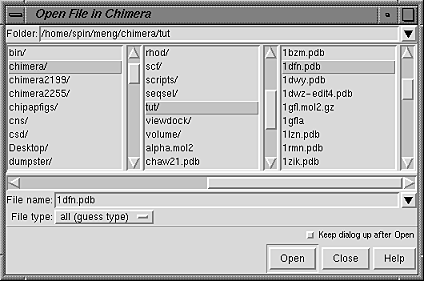 All registered file types are included in the Chimera Open File Dialog. If the dialog is called from a specific tool (Volume Viewer, for example) the types may be limited to those specific to the tool (in this case, various volume data file formats). If a tool-specific file type is opened, the associated tool will be executed or started, if it has not been started already. The names of recently opened files are available from a pulldown menu to the right of the File name field (marked with a black inverted triangle). When a file is opened, the file pathname is added to the recent file list. The recent file list and the most recent File type setting for each open dialog are stored in the preferences file. The names of recently saved files are available from a pulldown menu to the right of the File name field (marked with a black inverted triangle). When a file is saved, the file pathname is added to the recent file list. The recent file list and the most recent File type setting for each save dialog are stored in the preferences file.